Meditation – stop running – observe thoughts/emotions/desires/aversions – don’t flee or try to fix or cling to them. Non-attachment. LET THE CLAMOUR BE. This is the first big step towards non-attachment: learning to view passing thoughts and feelings as if one were a spectator, not a participant. It is illuminating to note, here, how the daily rituals and working routines of prolific authors and artists – people who really do get a lot done – very rarely include techniques for ‘getting motivated’ or ‘feeling inspired’. Quite the opposite: they tend to emphasize the mechanics of the working process, focusing not on generating the right mood, but on accomplishing certain physical actions, regardless of mood. Goals – Goals/planning is a result of how uncomfortable we are made by feelings of uncertainty. Science has shown us the vastness and complexity of the universe. Our difficulty in comprehending it causes a feeling of insecurity. To fully embrace the experience of failure, not merely to tolerate it as a stepping-stone to success, is to abandon this constant straining never to put a foot wrong. It is to relax. It allows you to abandon the stressful and tiring struggle of perfectionism. Memento Mori – complete the sentences ‘I wish I’d spent more time on … ‘, and ‘I wish I’d spent less time on … ‘. This turns out to be a surprisingly effective way to achieve mortality awareness in short order. they argued that it pointed to an alternative approach, a ‘negative path’ to happiness, that entailed taking a radically different stance towards those things that most of us spend our lives trying hard to avoid. It involved learning to enjoy uncertainty, embracing insecurity, stopping trying to think positively, becoming familiar with failure, even learning to value death. that the effort to try to feel happy is often precisely the thing that makes us miserable. And that it is our constant efforts to eliminate the negative – insecurity, uncertainty, failure, or sadness – that is what causes us to feel so insecure, anxious, uncertain, or unhappy. You’ll find it in the works of the Stoic philosophers of ancient Greece and Rome, who emphasised the benefits of always contemplating how badly things might go. It lies deep near the core of Buddhism, which counsels that true security lies in the unrestrained embrace of insecurity – in the recognition that we never really stand on solid ground, and never can. It underpins the medieval tradition of memento mori, which celebrated the life-giving benefits of never forgetting about death. And it is what connects New Age writers, such as the best-selling spiritual teacher Eckhart Tolle, with more mainstream recent work in cognitive psychology on the self-defeating nature of positive thinking. The ‘negative path’ is about rejecting this dichotomy, and seeking instead the happiness that arises through negativity, rather than trying to drown negativity out with relentless good cheer. If a fixation on positivity is the disease, this approach is the antidote. even most people who disdain the ‘cult of optimism’, as the philosopher Peter Vernezze calls it, end up subtly endorsing it. They assume that since they cannot or will not subscribe to its ideology, their only alternative is to resign themselves to gloom, or a sort of ironic curmudgeonhood, instead. By contrast, the negative path offers no such single solution. Some of its proponents stress embracing negative feelings and thoughts, while others might better be described as advocating indifference towards them. Some focus on radically unconventional techniques for pursuing happiness, while others point towards a different definition of happiness, or to abandoning the pursuit of it altogether. one crucial foundation of their approach is precisely that happiness involves paradoxes; that there is no way to tie up all the loose ends, however desperately we might want to. Wegner labelled this effect ‘the precisely counterintuitive error’, which, he explained in one paper, ‘is when we manage to do the worst possible thing, the blunder so outrageous that we think about it in advance and resolve not to let that happen. We see a rut coming up in the road ahead, and proceed to steer our bike right into it. 2 What Would Seneca Do? a well-functioning mind may be built so as to perceive the odds of things going well as greater than they really are. Healthy and happy people, research suggests, generally have a less accurate, overly optimistic grasp of their true ability to influence events than do those who are suffering from depression. nothing outside your own mind can properly be described as negative or positive at all. What actually causes suffering are the beliefs you hold about those things. Which brings us to an important milestone on the negative path to happiness – a psychological tactic that William Irvine argues is ‘the single most valuable technique in the Stoics’ toolkit’. He calls it ‘negative visualisation’. The Stoics themselves, rather more pungently, called it ‘the premeditation of evils’. The premeditation of evils is the way to replace these irrational notions with more rational judgments: spend time vividly imagining exactly how wrong things could go in reality, and you will usually find that your fears were exaggerated. Happiness reached via positive thinking can be fleeting and brittle; negative visualisation generates a vastly more dependable calm. The only things we can truly control, the Stoics argue, are our judgments – what we believe – about our circumstances. tranquility results from replacing our irrational judgments with rational ones. And dwelling on the worst-case scenario, the ‘premeditation of evils’, is often the best way to achieve this – even to the point, Seneca suggests, of deliberately experiencing those ‘evils’, so as to grasp that they might not be as bad as you’d irrationally feared. Non-attachment need not mean withdrawing from life, or suppressing natural impulses, or engaging in punishing self-denial. It simply means approaching the whole of life – inner thoughts and emotions, outer events and circumstances – without clinging or aversion. To live non-attachedly is to feel impulses, think thoughts, and experience life without becoming hooked by mental narratives about how things ‘should’ be, or should never be, or should remain forever. 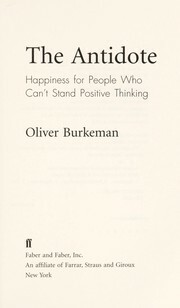 The point, instead, was to learn how to stop trying to fix things, to stop being so preoccupied with trying to control one’s experience of the world, to give up trying to replace unpleasant thoughts and emotions with more pleasant ones, and to see that, through dropping the ‘pursuit of happiness’, a more profound peace might result. Meditation, the way he described it, was a way to stop running. You sat still, and watched your thoughts and emotions and desires and aversions come and go, and you resisted the urge to try to flee from them, to fix them, or to cling to them. You practised non-attachment, in other words. Whatever came up, negative or positive, you stayed present and observed it. It wasn’t about escaping into ecstasy – or even into calmness, as the word is normally understood; and it certainly wasn’t about positive thinking. It was about the significantly greater challenge of declining to do any of that. An understandable response to such chatter, when you’re attempting to meditate, is to try to quieten it – to dampen it down, or perhaps even to try to stop thinking altogether. But one central principle of vipassana meditation, the variety taught at the Insight Meditation Centre, is the opposite: to let the clamour be. Rather, we let things rise and fall, come and go, and simply be … there will be times in meditation when we’re relaxed, and times when our minds are agitated. We do not seek to attain a relaxed state, or to drive out our agitated and distracted mind. That is just more agitation.’ This is the first big step towards non-attachment: learning to view passing thoughts and feelings as if one were a spectator, not a participant. It is illuminating to note, here, how the daily rituals and working routines of prolific authors and artists – people who really do get a lot done – very rarely include techniques for ‘getting motivated’ or ‘feeling inspired’. Quite the opposite: they tend to emphasise the mechanics of the working process, focusing not on generating the right mood, but on accomplishing certain physical actions, regardless of mood. The head of psychiatry at Jikei University School of Medicine in Tokyo, Morita was heavily influenced by Buddhism, and especially its perspective on thoughts and emotions as mental weather – as things that happen to us, and with which we can coexist in peace. But the deeper truth remains: many of us are perpetually preoccupied with plans. what motivates our investment in goals and planning for the future, much of the time, isn’t any sober recognition of the virtues of preparation and looking ahead. Rather, it’s something much more emotional: how deeply uncomfortable we are made by feelings of uncertainty. we could learn to become more comfortable with uncertainty, and to exploit the potential hidden within it, both to feel better in the present and to achieve more success in the future. Uncertainty] feels like you’re sinking, and [that] it is positively imperative to scramble to the next patch of firm ground, whatever direction it may be in. Once you get there, you can let yourself breathe.’ Clinging too tightly to goals is one of the principal ways in which we express the obsession with reaching that next patch of ground. One foundation of effectuation is the ‘bird in hand’ principle: ‘Start with your means. Don’t wait for the perfect opportunity. Start taking action, based on what you have readily available: what you are, what you know and who you know.’ A second is the ‘principle of affordable loss’: don’t be guided by thoughts of how wonderful the rewards might be if you were spectacularly successful at any given next step. Instead – and there are distinct echoes, here, of the Stoic focus on the worst-case scenario – ask how big the loss would be if you failed. So long as it would be tolerable, that’s all you need to know. Take that next step, and see what happens. Causally minded’ people, to use Sarasvathy’s terminology, are those who select or are given a specific goal, and then choose from whatever means are available to make a plan for achieving it. Effectually minded people, on the other hand, examine what means and materials are at their disposal, then imagine what possible ends, or provisional next directions, those means might make possible. See what happens’, indeed, might be the motto of this entire approach to working and living, and it is a hard-headed message, not a woolly one. ‘The quest for certainty blocks the search for meaning,’ argued the social psychologist Erich Fromm. ‘Uncertainty is the very condition to impel man to unfold his powers.’ Uncertainty is where things happen. The sense of self that we construct from identifying with our thoughts is what Tolle calls the ‘ego’. (Different thinkers use this term in very different ways.) And by definition, living in the service of the ego can never make us happy. The ego that results from this identification has a life of its own. It sustains itself through dissatisfaction – through the friction it creates against the present moment, by opposing itself to what’s happening, and by constantly projecting into the future, so that happiness is always some other time, never now. The ego, Tolle likes to say, thrives on drama, because compulsive thinking can sink its teeth into drama. The ego also thrives on focusing on the future, since it’s much easier to think compulsively about the future than about the present. (It’s really quite tricky, when you try it, to think compulsively about right now.) If all this is correct, we have inadvertently sentenced ourselves to unhappiness. Compulsive thinking is what we take to be the core of our being – and yet compulsive thinking relies on our feeling dissatisfied. And the ‘cult of optimism’ is all about looking forward to a happy or successful future, thereby reinforcing the message that happiness belongs to some other time than now. Schemes and plans for making things better fuel our dissatisfaction with the only place where happiness can ever be found – the present. And that’s a revelation for some people. To realise that your whole life is only ever now. It can be curiously difficult to identify any problems that afflict you at this very moment, in the present – and it is always the present. No wonder, then, that we sometimes risk making ourselves less secure by chasing feelings of security. there might be something more fundamentally problematic about the goal of security; and that real happiness might be dependent on being willing to face, and to tolerate, insecurity and vulnerability. We protect ourselves from physical danger by moving to safer neighbourhoods, or even locking ourselves inside gated communities, but the effects of such trends on community life have been demonstrated to have a negative effect on collective levels of happiness. We might think we want security more than anything, but when it comes down to it, we don’t. To love at all is to be vulnerable. Love anything and your heart will be wrung, and possibly broken. If you want to make sure of keeping it intact, you must give your heart to no-one, not even an animal. Wrap it carefully round with your hobbies and little luxuries; avoid all entanglements; lock it up safe in the casket or coffin of your selfishness. But in that casket – safe, dark, motionless, airless – it will change. It will not be broken; it will become unbreakable, impenetrable, irredeemable. related approaches, we seek the safety and solid ground of certainty, of knowing how the future will turn out, of a time in the future when we’ll be ceaselessly happy, and never have to fear negative emotions again. But in chasing all that, we close down the very faculties that permit the happiness we crave. ‘Things are not permanent, they don’t last, there is no final security,’ she says. What makes us miserable is not this truth, but our efforts to escape it. Kibera feels not so much like a place of despair as a hotbed of entrepreneurialism. International surveys of happiness – including several reputable research projects such as the World Values Survey – have consistently found some of the world’s poorest countries to be among the happiest. why is it that places such as Kibera aren’t unequivocally at the bottom of every assessment of happiness levels, every time? The point is certainly not that it’s better not to have money, say, than it is to have it. But it’s surely undeniable that if you don’t have it, it’s much harder to overinvest emotionally in it. The same goes for prestigious jobs, material possessions, or impressive educational qualifications: when you have little chance of obtaining them, you won’t be misled into thinking they bring more happiness than they do. More broadly, living in such desperate circumstances means that shutting out feelings of insecurity is not a viable option. You have to turn and face the reality of insecurity instead. The people of Kibera are vulnerable whether they like it or not. Above all, living in a situation of such inherent insecurity, while very far from preferable, was clarifying. Nobody would envy it. But living with fewer illusions meant facing reality head on. Not having the option of trying to protect yourself in counter-productive ways made for a resilience in the face of hardship that qualified, in the end, as a modest but extremely durable kind of happiness. there is one overwhelming explanation for his era’s feelings of insecurity: the progress of science. There is a contradiction in wanting to be perfectly secure in a universe whose very nature is momentariness and fluidity,’ he writes. Life is a dance, and when you are dancing, you are not intent on getting somewhere. The meaning and purpose of dancing is the dance. complete the sentences ‘I wish I’d spent more time on … ‘, and ‘I wish I’d spent less time on … ‘. This turns out to be a surprisingly effective way to achieve mortality awareness in short order.